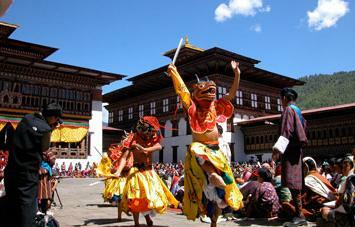 Adventure Pilgrims Trekking Offers the Bhutan Trips with local travel partners in Bhutan. We have been working together for last decked. Bhutan’s numerous rivers provide visitors with new adventures. The two most popular rafting routes are the Po Chhu and the Mo Chhu rivers in Punakha. This very pleasant one day rafting trip takes you on the rivers that flow past the formidable Punakha Dzong, and ends with a lunch on the banks of the river. There are different classes of white water rafting ranging from the easy to the adventurous. You can take your pick. Adventure Pilgrims Trekking Pvt. Ltd. ensures that your rafting journey is a pleasant and memorable experience. Fresh air, limited traffic and scenic highways provide for an exhilarating Himalayan biking adventure. Bhutan offers both professional and amateur cyclists the opportunity to discover the country on bicycle. Tour the country by following part of the national highway that takes you over mountain passes, small towns and villages. You can choose from easy to adventurous trails as you tour Bhutan on your two wheels, backed up by professional support staff all along the way. Bhutan Travelers will help co-ordinate your travel and you can choose to bring your bicycles or ask Adventure Pilgrims Trekking Pvt. Ltd. to arrange quality mountain bicycles for your riding pleasure. Day 1 : The flight to Paro crosses the Himalayan Mountains affording spectacular views of the awesome peaks, including the sacred Jumolhari and Jichu Drake peaks in Bhutan . On arrival you will be greeted by our representative and transferred to your hotel. In the afternoon you can visit the Paro Dzong. It was built in 1646 and now houses government offices and religious institutions, as do all the Dzongs (forts) currently. You'll cross a traditional wooden bridge on the way to the Dzong. Afterward you will visit Kichu Lhakhang, the oldest temple in the country. From there you will be taken to the Drukgyal Dzong (Bhutan Victory Fort), which was built in 1646 to commemorate Bhutan 's victory over Tibetan invaders during the 1600s. On a clear day you can see Mount Jumolhari , Bhutan 's second-highest mountain at 7,329 meters, from the village below the Dzong. In the evening you can stroll through the Paro market and town. Overnight hotel in Paro. Day 2 : After breakfast hike to Taktsang (Tiger's Nest) Monastery, which is Bhutan 's most famous monastery. Guru Rinpoche is said to have flown on the back of a tigress from Singye Dzong in Lhuntse to meditate in a cave where Taktsang Monastery now stands. It is perched on the edge of a steep cliff, about 900 meters above Paro Valley . Lunch would be served in the hotel on the way. Overnight at the hotel in Paro. Day 3 : After early breakfast you will drive or ride on bikes on several stretches of road till you stop en route for lunch at Dochu La (3,100 meters), where on a clear day you can get spectacular views of the Himalayan Mountains . Start biking downhill from the Dochula Pass till you reach Punakha. It is an exhilarating ride. Check into hotel in Punakha. Overnight hotel in Punakha. Day 4 : After break fast, hike through a forest of pines and farmlands along the bank of Pho Chu River for about 2 hours till you reach Samdhingkha (put in). Your rafting crew will be waiting here for you. Then start rafting along the Pho Chu River coming across stretches of Class II and IV rapids. Upon arriving at a beach-like stretch of sand, some distance from a Chorten, you will be served lunch on the sandy embankment. The post-lunch rafting session will continue till you reach the relatively placid section of the river below the Punakha Dzong. After tea, drive to Gangtey through the forests of oak, rhododendron, and bamboos. Overnight hotel in Gangtey. Day 8 : In the morning you'll visit Trongsa Dzong, the masterpiece of Bhutanese architecture, and you'll also see Ta Dzong, the watchtower built to defend this Dzong. 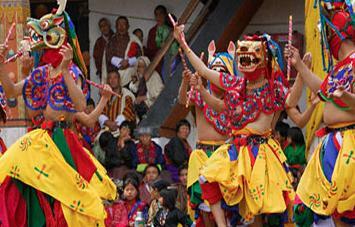 After lunch, you'll proceed to Bumthang, the religious heartland of the nation, with lush valleys and hilly forests. After crossing a high pass, guests can bike all the way to Bumthang. The road is broad and all downhill after the pass. You can spend the evening strolling through Bumthang town. Overnight hotel in Bumthang. Day 9 : Day excursion to Tang Valley . Tang valley is the most remote valley in Bumthang, and this will make a nice enjoyable excursion. You'll make a stop in Tang valley for lunch and will have a chance to visit the Ugyen Chholing Palace and explore the village. On the way back to town, you will see Mebar Tsho ( Burning Lake ), where some of Guru Rinpoche's treasures were found in the 15th century by the famous treasure discover Pema Lingpa. It's a good place to meditate. You will also have a chance to tour Tamshing Lhakhang, a treasure house of interesting religious Buddhist paintings. In the evening you can visit local shops. Overnight hotel in Bumthang. Day 10 : Morning visit to Jambay Lhakhang, the monastery built in 7 th century by Tibetan King Songtsen Gampo, Tamshing Lhakhang, located on opposite side of the river is important place to visit, housing interesting religious paintings. Drive to Punakha with lunch en route. Overnight at the hotel in Punakha. Day 11 : After breakfast visit Punakha Dzong (the summer residence of mink bodies). After that ride on bikes for about 12 km to reach Khamsum Yulley Namgyal Chorten, which is situated on a beautiful hillock, called Nizergang. It houses the paintings that belong to Nyingmapa Traditions. Ride back to Punakha for lunch. After lunch drive to Thimphu, and on the way stop at Metshina Village and walk across the rice field for about 20 minutes to visit Chime Lhakhang (the Temple dedicated to Devine Madman). Check into hotel in Thimphu . In the evening stroll freely in town. Overnight hotel in Thimphu . Day 12 : In the morning you can hike to Tango Monastery, which was built by the "Divine Madman" in the 15th century. It's a center of study for monks, and it affords a great view of the Thimphu Valley . On the grounds of the monastery is a "sin-testing" tunnel--it is said that if you have sinned, you will get stuck in the tunnel, and if you are without sin, you will go through with ease! After lunch, you can hike to Cheri Monastery, which was built in 1620 and housed the first monk body. The Shabdrung father's ashes are contained inside the monastery. Overnight hotel in Thimphu . Day 13 : You can spend the morning shopping in Thimphu . If it's the weekend, you can stroll through the market to see the variety of food of the country, including basket upon basket of fiery chilies, fresh cheese, and mangoes. In addition, many stalls contain Bhutanese handicrafts and household items. It's fun to wander the aisles, taking in the bustling atmosphere of the market. In the afternoon, you will drive to Paro. 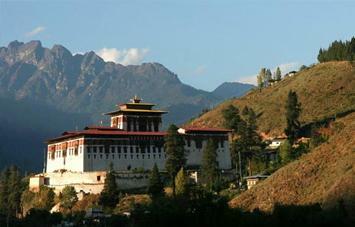 You will tour the National Museum , which was formerly the watchtower for the Paro Dzong. It now houses a collection of fine arts, paintings, Thangka, statues, and antiques. In the evening you can visit a traditional farmhouse and, if you wish, enjoy a hot-stone bath and a typical Bhutanese dinner. Overnight hotel in Paro. Day 14 : After break fast drive to the airport for departure.